Training, employment and job placement for people with disabilities, and other barriers to work. Goodwill equals independence. Without the services that Goodwill provides, many in our community would not have the opportunity to earn wages for themselves and their families. Thank you for helping us to give persons with disabilities and barriers to employment an opportunity for employment. Goodwill Industries of South Florida gives people with disabilities an opportunity to learn how to work and become independent. This young man works in the Apparel Manufacturing division helping to assemble military uniforms. 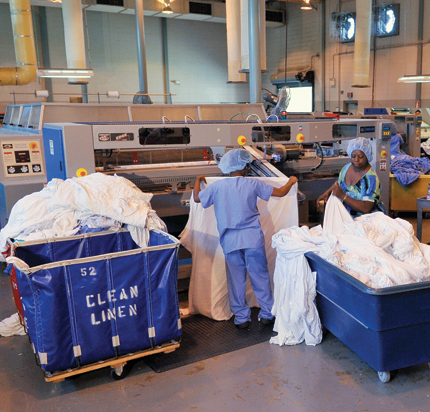 Goodwill's Laundry and Linen Services provides commercial laundry services in Southeast Florida and beyond. Purposely created and located in close proximity to Liberty City, the program gives a chance for people in one of the most economically depressed areas in South Florida. The laundry provides job training and employment opportunities for persons with disabilities and special needs, many of whom are poor and have been chronically unemployed. Goodwill Industries offers a variety of vocational opportunities to assist individuals with disabilities obtain and retain employment within the community. For those individuals who have the capabilities and necessary aptitudes and interests, there are vocational training programs available in the areas of: Office Careers, Power Sewing and Custodial. Classes are taught by Miami-Dade County Public School teachers certified by the State of Florida. The average length of time for each training curriculum is from 8 - 24 weeks, although all classes are open-ended to facilitate the learning process. A principal advantage of this program in Goodwill Industries is the large number of workstations that are available for work experience so that the individual can later be referred to a job having not only the training but also the actual work experience. The Spirit of Goodwill Band is the bases of the music program at Goodwill.The musical experience has had a profound impact on the participants' lives, helping them develop new skills, confidence, independent living skills, together with an enormous feeling of accomplishment and pride from the joy and satisfaction of making music. Goodwill manufactures the most important flag - the interment flag used at retired military personnel funerals. We also manufacture the state of Florida flag, and the City of Miami Flags. Vocational Rehabilitation helps individuals learn about their functional capacities and how to achieve their vocational goals. All individuals served by Goodwill participate in this program beginning with vocational evaluation. The evaluation includes the assessment of physical capability, academic ability, occupational awareness, and prevocational skills; as well as psychological and social assessments, independent living skills, work sampling, on the job evaluation, and behavioral observation. This evaluation determines whether participants are ready for employment, the type of employment, and alternative types of employment for which the individual could be trained in a minimal amount of time. After complete evaluation, participants are placed in one of the following programs: Work Activities/Adult Day Training (therapeutic work training for those with severe functional limitations), School Transition Program (academic and life skills/work experience for exceptional students ages 18-22 enrolled in the public school system), Vocational Training (training in office careers, industrial sewing, janitorial, and custodial), Work Services (transitional employment), or Job Development and Placement (training and guidance for permanent job placement in the community). Goodwill Industries offers a continuum of support services to our participants with the singular focus of helping them to get and maintain employment. Support services provided to participants includes: Counseling (participants are assigned to a counselor or social worker who handles case management responsibilities including monitoring progress and adjusting the rehabilitation plan as needed), Educational Services (certified teachers provide pre-vocational and survival skills training, and teach basic academic skills up to acquisition of the High School Graduation Equivalence Diploma [GED]), Medical and Psychological Services (comprehensive evaluation process including monitoring of medications and medical or psychological conditions) Employee Health Services (on-site medical department staffed by qualified registered employee health service practitioners), Social Development (through community based instruction and the music program this service enhances daily living skills, social skills, maturity, self-esteem, acceptance, competency and maintenance of fine and gross motor skills, and physical and perceptual motor coordination). Goodwill's unique model provides for the creation and operation of several business services which serve as opportunities for job training and employment for persons with disabilities and other barriers to employment. These programs provide a realistic work atmosphere in which persons served with an integrated vocational rehabilitation program have the opportunity to develop thier work skills, tolerances, work habits and many other disciplines that will make them competitively employable. The program consists of Donated Goods (Goodwill Stores), Custodial Services, Linens and Laundry Services, Commercial Services, and Apparel/Flag Manufacturing. Revenue from these activities helps to support job training and supportive services. Learn more about Goodwill Industries of South Florida Inc.